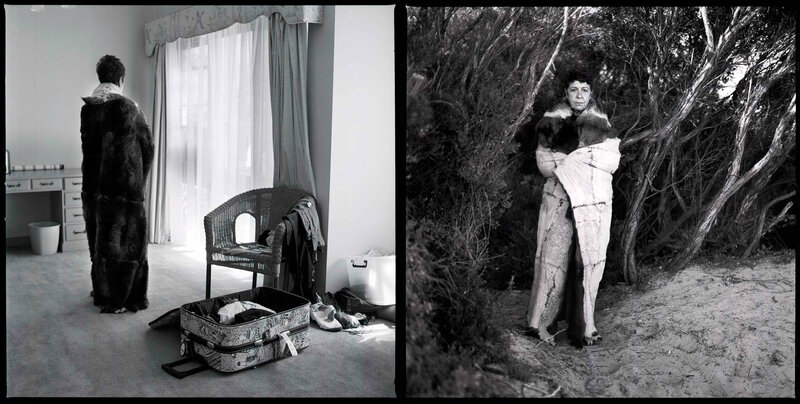 Home / On Country: Boonwurrung Elder Carolyn Briggs, silver gelatin print, 60x60cm, Koorie Heritage Trust, 2011 Carolyn Briggs champions the role of Indigenous cuisine in maintaining health and well-being. She recently closed the doors of her restaurant Tjanabi, in Federation Square, Melbourne, where Prime Minister Julia Gillard entertained United States Secretary of State, Hillary Clinton, in November 2010. The menu was based on Aboriginal peopleâ€™s six seasons and their traditional way of eating organic, locally grown food. Carolyn Briggs travelled to her Country on the Mornington Peninsula to take time to practice deep listening. She believes her people need to research where they came from, know who their ancestors are, their language and understand what it means to be Aboriginal. As a language specialist and respected Boonwurrung Elder, Aunty Carolyn oversaw the design of the Boonwurrung and Wemba Wemba cloaks made for the 2006 Melbourne Commonwealth Games Opening Ceremony.